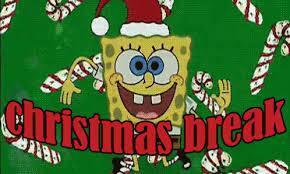 All campuses and administrative offices will be closed for Christmas Break 12/22/18 - 1/8/19. Staff Development will be held Monday, January 7, 2019 and students return to school on Tuesday, January 8, 2019. Merry Christmas! 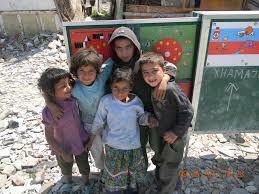 Christmas gifts to Albanian Kids! Advantage Academy is excited to announce its continued partnership with Heart & Home Ministries and the Butterfly Project in Tirana, Albania. The ministry serves many Albanian Roma children and families who are in dire need of food, clothing, shoes, shelter and other basic needs. Most Roma families and children in Albania live on the streets of Tirana near rivers or trash landfills to survive. Educational opportunities are very limited or non-existent. On Friday, December 14th, all jean money paid on Spirit Day will go directly to provide Christmas presents and other basic needs for the Roma children of Tirana, Albania. We are asking ALL STUDENTS to pay their normal $1 for Friday Jean Day to wear jeans and and additional $1 if you would also like to wear a Christmas shirt or sweater that day and all AA staff too! Additional donations are also welcome and 100% of the proceeds will go towards the Butterfly Project for the Albanian Roma Children! Choose the link below to make a one-time or monthly recurring donation with your Mastercard, Visa or Discover credit/debit card through the MySchoolBucks secure website. There will be no school for students or staff on Monday, October 8, 2018 due to Columbus Day. All campuses and administrative offices will be closed. 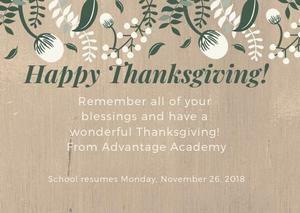 Classes resume on Tuesday, October 9, 2018. This letter was sent to all PK-12 families via email. Read more for the school uniform and spirit shirt information. All campuses begin classes on Tuesday, August 21st. 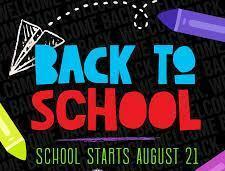 Elementary-8th grade start at 7:50 am & 9th-12th graders start at 8:00 am. Click the link below to view the dismissal and more information. Each year, the Texas Education Agency (TEA) holds District’s accountable for their financial decisions through the Financial Integrity Rating System of Texas (FIRST) rating. The rating is designed to encourage Texas public schools to better manage their financial resources to provide the maximum allocation possible for direct instructional purposes. There are many factors that are considered when determining the FIRST rating. 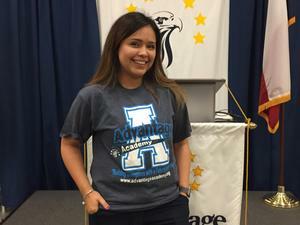 Advantage Academy has received a “superior achievement” FIRST rating designation. The “superior achievement” designation is the highest possible rating possible a school district can receive. For more information on the FIRST rating, please visit the TEA website. 3rd-12th STAAR & EOC State Assessment results are now available. The website link below will provide your child’s results and to learn more about your child’s STAAR performance, how questions were answered and how you can provide additional support at home this summer and next school year. For Spanish speakers choose the en Español in the top right corner of the site. Each student has a unique access code to view results. To obtain the unique access code choose “find my access code” under the login section.